An outdoor dining terrace and the balconies of the rooms have impressive views over the busy harbour and the Mediterranean sea. The Parador Malaga Gibralfaro is in the old quarter of the city on mount Gibralfaro, an area of pine trees looking down over the town. Opposite the hotel is the "Alcazaba" citadel which was built by the Moors. It was captured in 1487 after a siege lasting 40 days. The name comes from the old lighthouse ("faro") which used to stand on the hill to guide vessels into the harbour and also to warn of attacks by pirates. The Malaga Gibralfaro Parador gives the high level of luxury and service expected in hotels of the group. The lounges and bedrooms are excellently furnished and a fine swimming pool is on the top floor. Guests may also use the facilities of the Parador del Golf on the outskirts of the town which has all the facilities for golfers or for those wanting to learn the game. To commemorate its most famous local citizen of modern times, the Parador restaurant has a Picasso painting on its wall. "Pechuga de pollo Villaroy" being a fried breast of chicken with potatoes and vegetables or a salad. At the end of the meal sample one of the dessert wines which have been produced in the Malaga area since Roman times. There is much to see in the city of Malaga. Visit the cathedral and the castle, the archaeological museum and the Roman theatre. There are big celebrations at Easter every year which are well worth attending. At other times of the year you can visit the churches of Santiago and Sagrario and the Bishops Palace. The beaches of the Malaga area are a famous tourist attraction and get very busy in the peak of the holiday season and the same applies to the shops, bars and restaurants in the tourist area of the town. 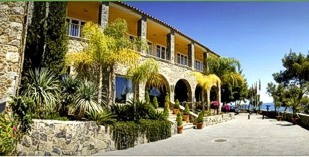 The Parador of Malaga Gibralfaro has thirty three twin bedded rooms and five bedrooms with a double bed. All the rooms have a private bathroom. Each room has a telephone, satellite television, safe and a mini bar. The hotel has air conditioning and central heating, currency exchange, lift, parking facilities (without security and limited places), satellite television, free wireless internet, garden, restaurant and bar. Facilities to hold business meetings are available. Some of the rooms are specially equipped for the disabled. An outdoor seasonal swimming pool is on the upper floor of the Parador. Due to its small size in a very popular destination, the demand for rooms is very great and early reservations are essential. Distance from the nearest airport is approximately 10 kms, train station is 3 kms away and the nearest port is 3 kms away. Pets are not allowed in the Parador. We stayed at this Parador in May. Fabulous location overlooking Malaga. We like walking so the location at the top of the hill next to the castle wasn't a problem. We walked to Malaga and back most days. The staff were friendly and helpful and we had a lovely, spacious room with large bathroom and balcony. Wonderful restaurant with a small balcony for outside eating. We stayed 6 nights and the food was consistently good. The outside terrace area for lunches and coffee was a delight. This was our first visit to a Parador and we were impressed. Would certainly stay at the Gibralfaro again. Malaga has lots to offer. Would recommend buying a guide book so you don't miss anything. We have used this Parador for our 1st and last night in Spain on 2 occasions now, initially because of its proximity to Malaga airport and now additionally because of its panoramic view and quiet location on the side of hill on the edge of Malaga. All other services were very agreeable; staff, service, rooms, parking and general facilities. We had a wonderful stay in this Parador. The staff were friendly and welcoming at Reception, in the bar and in the restaurant. The room had wonderful views over the bay and got the afternoon sun so we were happy to come back and read on the balcony. The internet connection was speedy and available throughout the Parador. It was so easy to walk down into Malaga itself to visit the Museums and then get the small bus back up if we were too tired to do the climb. We have booked again for next year. We stayed 4 nights and were very satisfied about this Parador. Room was very comfortable, nice and well cleaned. Nice terrace with lovely view. Fortunately we had a rental car, which you need to get into town (otehrwise taxi). Breakfast offered a wide range of choice. Not very much tables outside to enjoy breakfast on the terrace (hotel might consider to split all tables into tables of 2). Id idn't found the staff at breakfast particularly friendly but it certainly did bother us. We can highly recommend this place. 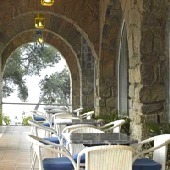 Parador de Malaga Gibralfaro is a hotel in the old quarter looking over the town and the bay.